Liang Liang is feeling a lot of stress lately. He owns an import wholesale business in Los Angeles. “I have been watching the news every day — when will the tariffs be put in place? When are my goods arriving; it’s a fight against time. I’m trying to order all my products for the rest of the year,” he said. His goods, such as toys and T-shirts, come from China through the largest port complex in the United States, the twin ports of Los Angeles and Long Beach. He expects a 10 to 20 percent increase in shipping costs because of the trade war between the United States and China. FILE - Shipping containers sit at the ports of Los Angeles and Long Beach, Calif., in this aerial photo, Feb. 6, 2015. China is the largest trading partner for both ports. China is the largest trading partner for both ports. As tariffs from both countries increase the cost of goods, manufacturers and retailers may order fewer products, which will cause a decrease in trade volume between the two countries, according to Stephen Cheung, president of the World Trade Center Los Angeles. “Once that happens, you’re going to see an increase in the rates for shipping because then you don’t have the volume to justify the goods going back and forth,” he said. Cheung explained that shipping costs will affect all goods between the U.S. and China, not just the ones on the list to be taxed. He said the trade and logistics sector, which includes the ports and the supply chain of trucks and warehouses, will be the first to feel the effects of the trade war. Liang said he will absorb the cost and live with smaller profits, up to a point. “If the tariffs increase by another 20 percent, we’ll have to raise our prices,” he said. “The consumers are going to feel it in their wallets very quickly,” Cheung said. FILE - A container ship is docked at the Ports of Los Angeles and Long Beach, Calif., in this aerial photo, Feb. 6, 2015. Once the trade war sets in, shipping rates for all good will likely increase, said Stephen Cheung, president of the World Trade Center Los Angeles. The U.S. as a manufacturing center depends on parts from China, but that supply may become less reliable as the trade war continues. Cheung said there may be uncertainty about whether the products will be produced or “whether they will be in the same price, so this potentially can have a huge aspect in terms of our exporting capability not only to China but to the rest of the world, Cheung said. “And there are a lot of jobs that are tied to this,” he added. 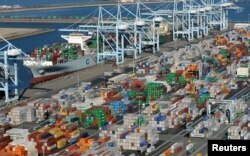 Officials at the ports of Long Beach and Los Angeles said it is too early to tell the impact of the trade tariffs. “We’ll have to wait and see how various businesses restructure their supply networks and adjust to the tariff environment,” said Duane Kenagy, the Port of Long Beach’s interim deputy executive director. He said so far, the port has seen record container volumes this year, but there is concern. “The impacts of a sustained long-term trade war could be devastating to both economies,” Kenagy said. Liang said he has hope, saying he thinks the trade war is actually political theater for the U.S. and China. “China also has its position on trade. The Chinese government also has to be accountable to the 1.4 billion people of China. I think China and the U.S. will disagree over trade on the surface. (For Trump), it’s a show for the November midterm elections, so he can be accountable to the electorate,” Liang said. Washington has been critical of China’s unfair trade practices and concerned with a trade imbalance. The U.S. imported more than $500 billion of Chinese goods last year compared to $130 billion of U.S. products exported to China. These concerns and issues of American intellectual property are reasons the Trump administration announced tariffs on an additional $200 billion in Chinese imports. “If you’re utilizing this as a tactic, that’s fine. What are the steps that you’re going to use to mitigate some of these damages that will be happening to the local community? These are huge issues that have not been addressed yet,” Cheung said.